Recently I camped out with the family at Deception Pass State Park, one of the true gems in Washington State's park system. While beach combing and fishing for humpies, we came across a six-foot long strand of bull whip kelp (Nereocyctis luetkeana) that had washed ashore. The kelp looked like it was still in good shape (it didn't have the white splotches characteristic of an over-the-hill specimen), so we bagged it up and took it home. Healthy kelp forests are the old-growth stands of the ocean. A hundred feet or more in length from sea floor to surface, they support a diversity of life. I've seen this diversity first-hand while free-diving in Puget Sound. Lingcod, greenling, and rockfish forage among the kelp forests; sea otters, seals, and other critters seek refuge from predators; and countless invertebrates make their homes there. 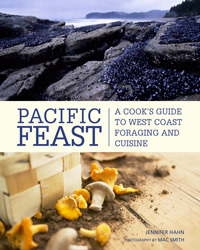 Our find immediately put me in mind of Jennifer Hahn and her wonderfully useful and poetic Pacific Feast: A Cook's Guide to West Coast Foraging and Cuisine. Hahn calls seaweeds the "most nutritious vegetables on Earth"—and the only vegetables that dance: "They jump and jerk to the bass thunder of waves. They shimmy and shake to the ebb and flood tide." I just knew she would have a good recipe for the kelp. Sure enough, when we got home I thumbed through my copy and found this recipe for pickled kelp. 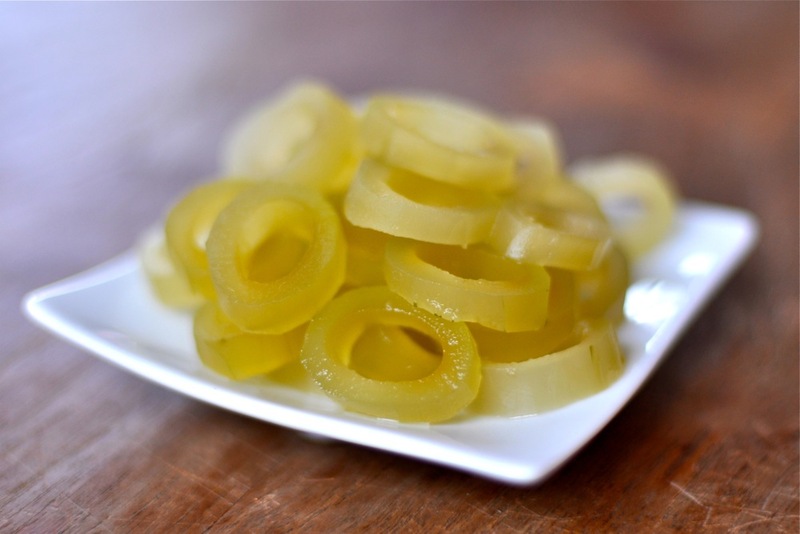 I've eaten plenty of kelp pickles over the years but never actually made them myself. 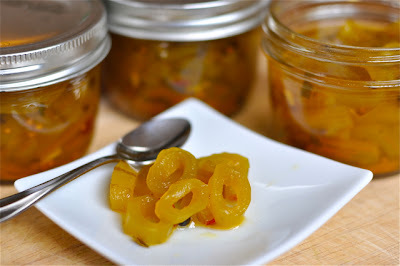 For this recipe, imagine a typical bread-and-butter pickle, with its crunch and spicy sweetness, and add to it a subtle hint of the sea. After tasting these pickles, you'll look at a seaweed-strewn beach in a whole new way. I cut Jennifer's recipe in half since my strand of kelp was on the small side, and I probably could have cut it in half again. 1. Make the brine. Mix vinegar, garlic, spices, and white sugar in a sauce pan. Set aside. 2. Cut the kelp into foot-long sections. Peel each section with a potato peeler. 3. Slice each peeled section into 1/4-inch rings. 4. Add the kelp rings into the brine and set aside for 2 hours, stirring occasionally. 5. After brining for 2 hours, boil contents for 5 minutes. 6. Spoon kelp rings and juice into canning jars and process in hot water bath for 10 minutes. The pickles cure in three weeks, although we couldn't wait; after just a week in the jar they tasted darn good and brought back fine memories of a sunny long weekend at the beach. Note: check state and local regulations before harvesting seaweeds. In Washington it's only legal to harvest beached bull whip kelp; cutting a living kelp stipe is illegal. Just a note that the otters you saw in the kelp beds in Washington are river otters and not seas otters. Sea otters are extremely endangered and only abundant in the north Pacific. No water in the brine? I've never pickled kelp before, but it seems odd to have vineagar only in the brine. Chris - That's right, river otters, though sea otters certainly use the kelp beds in their range. Evalyn - No water in this recipe. Mike - Try kelp pickles. Might be more in your wheelhouse.